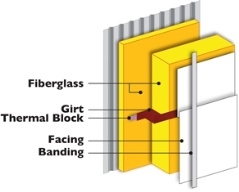 Filled Cavity Single and Double Layer Systems have been developed to provide exceptional thermal performance in typical metal building wall assemblies. 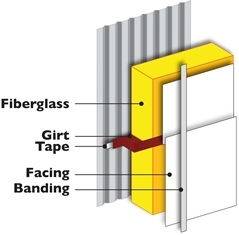 U-Values as low as 0.035 can be achieved when utilizing double layer fiberglass installation techniques. Thermal testing has been conducted at the an independent certified laboratory. Testing was conducted in accordance with ASTM C1363, "Standard Test Method for Thermal Performance of Building Materials and Envelope Assemblies by Means of a Hot Box Apparatus"